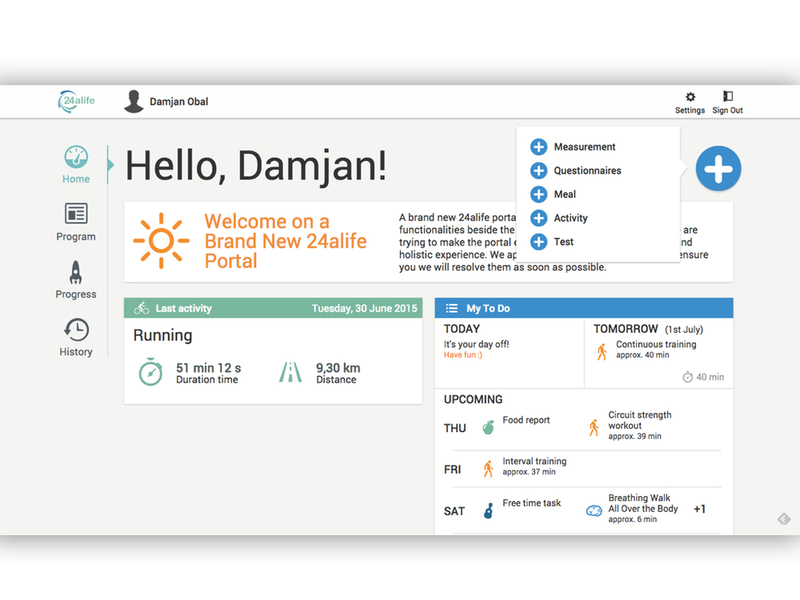 24alife (previously @Life) is a holistic corporate (and personal) wellbeing platform with web, native mobile and desktop applications. The product is accompanied with an expert service, stretching from doctors, nutritionists and psychologists who collaborate on the platform and tailor individual programs. The owners asked me to join as the UX lead to create a design team from scratch, to work with their existing 30+ strong development team. The challenge was to bring experts, researchers and industry partners on the same page. The second challenge was how to design a truly holistic solution spanning across web, mobile and desktop applications. 24alife covers the whole process, from your visit at the doctor to your meeting with a nutritionist or fitness trainer. The task was to find a way to hide the complexity and keep the users engaged. Together with my team, we started from scratch and decided to involve all stakeholders as much as possible, as early as possible and be as visual as possible. We invested heavily in creating a set of well documented user journey maps and created multiple personas. Both were communicated with all stakeholders and adopted throughout the company and all partners involved. The products were designed as minimal as possible, leaving space for white label adoption and personalisation. The design guidelines were strict, well documented and were used by designers, researchers and developers in India, Slovenia and the USA. As the Head of User Experience and Design, I had to first assemble the team, onboard and mentor them and craft a clear UX strategy. My role was to lead the user research phase, with user journeys, card sorting, and persona design workshops. I helped create the design guidelines and product documentation and designed hi-fi mockups for most of the products. After that, my role was to own and overview the design implementation and guide both UI designers and developers. My trusted designers in the amazing team were Karmen Kerec, Marusa Novak, Ziga Barber and later Luka Simunovic. The 24alife web application functions as an overview. Users can follow their progress, manually add/modify activities and access advanced features. The design was implemented by Ziga Barber and Luka Simunovic. The main goal was to onboard new businesses and partners. Final (v 2.0) of the landing site. Web dashboard where users can see all their activities, progress and open tasks. The mobile application is the extension of the web application. If the web application functions as a dashboard and an activity diary, the mobile application functions as your companion. The app is packed with features which was a challenge for us of we wanted to keep it simple. My proposed solution to the complexity and information overload is the concept of “bricks” that function as a to-do list. They use hierarchy to show what needs to be done first. From paper to Balsamiq. And repeat it several times pinging it between Dubai, Slovenia and the USA. The design sprints were done on a weekly basis. We launched the app on iOS and Android after less than 6 months of design and development. Still very proud on the "Bricks" we invented. We also launched separate mobile apps, to engage with the general audience. The user experience was more playful, a bit quirky, but with the 24alife colors and the general looks & feel. Step is a slick and especially fun pedometer that is one of the iOS applications we designed to keep the 24alife users engaged. Food experts from Slovenia as well as the US Mayo Clinic were involved in the design process. Food is half the diet, or so they say. Together with the experts I designed a food diary that works.